The genus of Artemisia, consisting of over two hundred mostly aromatic plants was named in honor of the sister and wife of the Greek/Persian King Mausolus who ruled after his death in 353 B.C. Artemisia was a famous botanist and medical researcher. This versatile family of artemisia includes many varieties, some grown for their culinary usage, others for their aromatic and medicinal properties. The medicinal values of artemisias were discovered by people living in semiarid and temperate regions where the plants are found. The better known members are the Wormwoods. The Common Wormwood (Artemisia Absinthium) gained a high reputation in medicine among the Ancients. According to the Ancients, Wormwood counteracted the effects of poisoning by hemlock, toadstools and the biting of the sea-dragon. In July’s Husbandry written by Tusser in 1577, he says: “It is a comfort for hart and the braine, and therefore to have it is not in vaine.” He recommends the plant’s foliage be strewn in chambers and laid among stuffs and furs to keep away moths and insects. In the ancient Greek text of Dioscorides, wormwood is mentioned for its internal worm-expelling property. Indians from New Mexico to British Columbia use similar varieties to treat bronchitis and colds. The Chinese still use a leaf of wormwood rolled up in the nostril to stop nosebleed. Culpepper said wormwood was the strongest of virtues among the three wormwoods most commonly known at that time. An old love charm goes like this: On St. Luke’s Day, take marigold flowers, a sprig of marjoram, thyme and a little Wormwood; dry them before a fire, rub them to powder; then sift it through a fine piece of lawn, and simmer it over a slow fire, adding a small quantity of honey and vinegar. Anoint yourself with this when you go to bed and you will dream of your partner that is to be. Mexicans consider wormwood an important herb; garlands of wormwood decorated dancers during the ceremonial dance celebrating the festival of the Goddess of Salt. The word ‘wormwood’ is synonymous for bitterness and may have acquired its label because its active ingredient, absinthol. Old Man Wormwood (A. absinthium) one of the more familiar artemisias, is a hardy perennial generally unharmed by frost. Native to the Mediterranean regions of Europe, it is naturalized throughout the temperate world including the northeastern and central United States. The earliest know record of this herb was found on a 1600 B.C. Egyptian papyrus. Wormwood is one of the bitter herbs mentioned in the Old Testament. 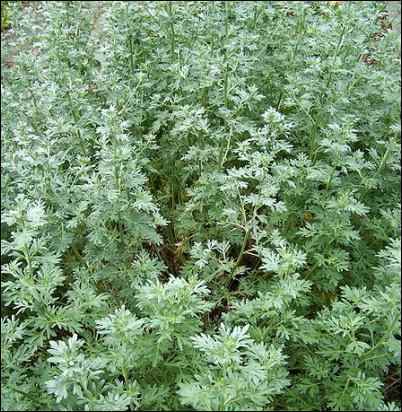 A. absinthium, the true wormwood, is a large gray shrub-like herb that will attain a height of four feet and has finely divided gray leaves with rounded oblong segments. The plant produces tiny, yellow flowers in late summer. Easily propagated by root division done either in the spring or fall. All wormwoods do well in average garden soil, though they prefer somewhat dry, well-drained garden beds. two and a half feet upon maturity. The plant has long stalks which drop its lower leaves as it gets older. With maturity, the long stems will curve downward and may even layer naturally if lying on soil. It prefers full sun but will tolerate partial shade; most of the wormwoods are tolerant of clay soils. This herb can be satisfactorily grown from seed, from cuttings or by root division of older plants. Self-sown seed usually produce sturdier plants. 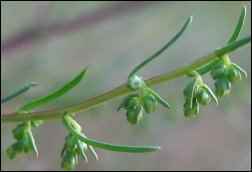 The leaves of wormwood secrete a bitter principle which inhibits the growth of other plants. Give wormwood at least a three-foot buffer between it and adjacent plants. In one experiment, lovage was actually killed by close proximity to wormwood. Based on an experiment by Korean researchers, it could be supposed that a wormwood tea could serve as a home-made garden herbicide. Its foliage is an interesting blue-gray shade; the leaf shape resembles chrysanthemums. Tall flower-heads form in late summer; small, round, greenish-yellow florets on an erect panicle. Situate your plants about two feet apart to allow for its sprawling habit of growth and keep the weeds away from the base of the plant. Wormwood is considered toxic to other plants and could inhibit their growth. Plant your wormwood in isolation to be safe, but be sure to include this lovely and historic herb in your garden. Pruning will help maintain its shrub-like appearance. A mature plant will last several years—wait to begin harvesting until its second year of growth. Harvest the top parts of the stalks after July when the plant is in flower, collecting only the green upper part. Cut back the bare stems to ground level. Hang drying bunches out of direct sunlight. Most Artemisias are happy with light, dry, well drained soil and can tolerate full sun. Best to increase plants by cuttings or root division. Harvest flowering tops and leaves in mid- to late summer for medicinal use. By late Autumn, wormwood is at the height of its glory and undeterred by frost. A. absinthium has long been recognized as the active ingredient in the alcohol drink, absinthe. Germans continue to use it to flavor wine and liquors. An ounce of flowers steeped in brandy for six weeks has proven to give great relief for gout. A tea is sometimes given to expel worms from the body. Its distinct acrid odor encourages its use as a strewing herb. Wormwood has long been recognized as an insect repellant – a present-day use is in our sachet bags or drawer-refresher blends. Southernwood (Artemisia abrotanum) is known by many names including ‘Lad’s Love,’ Boy’s Love,’ ‘Appleringie’ and most commonly, ‘Old Man.’ It is a hardy, many-branched perennial with feathery-looking, finely-divided grayish-green leaves. An old-time use for southernwood was to bring large bunches into church to help dispel feelings of drowsiness. At one time considered a deterrent to jail fever, bunches of southernwood along with rue were placed beside prisoners in dock. Best propagated by root division, (although cuttings also root easily), southernwood grows three to four feet high when grown in full sun. It can become a lush, green mound spilling over the border – allow two feet between plants for eventual spread. It does well in average soil and full sun but will take partial shade. A good pruning in the spring will keep it in shape. Considered winter-hardy in the South, Southernwood blooms in late August and September with small inconspicuous, yellowish-white flowers in loose panicles. A native of the south of Europe, especially Spain and Italy, it was introduced into England in 1548. Adelma Simmons of Caprilands mentions three varieties: A. a. limoneus is a lemon-scented variety and is grayer in color; the A. a. Camphorata is winter hardy and can be pruned to an attractive hedge two to three feet high to eliminate its spreading habit. It has a camphor scent. There is also a tangerine-scented southernwood which becomes a tall willowy herb up to seven or eight feet high. Its branches may not leaf out until June. Mrs. M. Grieve, in her inclusive A Modern Herbal, also lists a Field Southernwood (Artemisia Campestria) as being common in most parts of Europe but rare in Britain. Also a perennial, this species produces a thick, tapering root but its foliage is not aromatic. Stems remain prostrate until flowering with small and numerous flower-heads in long, slender, drooping racemes. The florets are yellow and bloom in August and September. This species has the same qualities, in a lesser degree, as the garden Southernwood. Linnaeus recommended an infusion of it as of use in pleurisy. In Italy, southernwood is employed as a culinary herb, however I was unable to discover in what manner. There is an old English custom of including a spray of this plant in the bouquets which country lads gave to their ladies. In the language of flowers, southernwood denotes jest…bantering; maybe those lads didn’t want to be taken seriously. Its essential oil, absinthol, is effective against insects, intestinal worms and some germs. Southernwood was routinely used in courtrooms and churches to ward off diseases. Being both an astringent and an antiseptic, southernwood is sometimes taken medicinally as a tea. It has been taken internally for the treatment of chilblains, and liver, spleen, ans stomach problems. A good stimulant tonic, it possesses some nervine properties. Southernwood tea has an agreeable taste but boiling removes some of the flavor and aroma. Just steep the leaves. The seed as well as the root is used against worms in children; they are given a teaspoon of the powdered herb in their food both morning and evening. Quoting Culpepper – “mashed leaves were used to draw out splinters and thorns.” In another instance he recommends: “ mixing the ashes with salad oil and applying to the face or head would cause the hair to grow again.” And, according to Jeanne Rose, a decoction made from southernwood and barley is good to use on acne breakouts. Companion gardeners know it has a reputation for deterring tomato hornworms. Mugwort, (Artemisia vulgaris) though less aromatic and attractive than other artemisias, features in the magical lore of Europe, Asia and China. Mugwort abounds on the banks and waysides in most parts of England. A tall-growing plant, its stems frequently reach three feet in height or more. Its distinguishing feature is the white under-surface of its leaves. The origin of this plant’s name is debated. Some say it derives from its use to flavor drinks; others suggest its name derives from moughte (a moth or maggot) because of earlier usefulness in keeping off the attacks of moths. In the Middle Ages, the plant was known as Cinulum Sancti Johannis because some believed that John the Baptist wore a girdle of it in the wilderness. It was believed to preserved the wayfarer from fatigue, sunstroke, wild beast and evil spirits. In Holland and Germany one of its name is St. John’s Plant because of the belief that it gave protection against diseases and misfortunes. Deter onion and carrot fly with branches laid between rows. Infuse to make a strong domestic disinfectant; a weaker solution for use as insecticide on older plants. 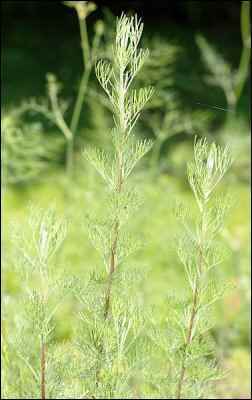 Wormwood may inhibit growth of plants nearby such as fennel, sage, caraway, anise. Europeans once stuffed pillows with mugwort in the belief that this would bring good, and vivid, dreams. Southernwood is known as the lovers’ plant, lad’s love and maid’s ruin. Chew on a tarragon leaf and you may notice a numb feeling on your tongue. The whole family of wormwoods are remarkable for the extremes bitterness of all parts of the plant. A perennial that can grow to six feet, mugwort is native to Eurasia, preferring full sun and a relatively rich, moist soil. Propagation is usually done by root division in the spring when plant is still dormant; dig up the clump and break it apart into small sections and replant. Harvest the leaves as the plant comes into bloom in August for drying; the root should be dug in autumn. Drying mugwort root is a long, complicated process and not complete until the root snaps when bent. Both herb and root are used primarily as treatment for complaints such as colic, diarrhea, constipation, intestinal spasms, and indigestion. They help to stimulate the secretion of gastric juices and bile. Some people have an allergic reaction to the plant and is not recommended taken during pregnancy or lactation. In China, mugwort is used to allay bleeding of the womb, treat threatened abortions as well as regulating the menses. Dioscorrides praises this herb and recommends the flowering tops be used just before they bloom. Gerard says: “Mugwort cureth the shakings of the joynets inclining to the Palsie.” Parkinson considered it good against hysteria. The juice and an infusion of the herb were given for intermittent fevers and agues. The downy leaves are contained in Moxa, a preparation used by the Japanese to cure rheumatism. Only the cottony fibers are made up into cones. Mugwort is valued as a nervine, being an old-fashioned popular remedy for epilepsy. It also has diuretic and diaphoretic action. Mugwort was commonly used to flavor beer at one time. Mugwort is occasionally used as an aromatic culinary herb, being one of the herbs used to stuff geese before roasting.